Many of the pictures and images of Native Americans depict the Indians in full War Paint but many also painted their horses with powerful symbols. An Indian horse was often painted in preparation for battle. Specific symbols were used, some of which can be seen on the above painting. The designs and symbols painted on horses were believed to hold magical powers for protection and to indicate previous victories in battle. The hoof print symbol has been painted on the side of the horse. Every hoof print symbolizes each animal taken on a raid. The long zig-zag lines symbolize lightning to add power and speed to the horse. The Great Plains Indians culture abounds with many more examples of this usage of symbols. For more facts and info see Native American Symbols. The Native American Indian valued their horses and held them in the highest esteem. Going into battle was dangerous for both the Native American and his horse. It therefore made sense to apply war paint to their horses as well as themselves. The achievements of warriors were often reflected in the symbolic images of their war paint. The clothes, tepees and all of his belongings, including his war horse, was decorated with the symbolism of his achievements or his various spirit guides. Every element of War Paint on the face and body of an American Native Indian had meaning. As did the symbols that decorated his Mustang horse - Horse War Paint. To recall special events: Victory, Mourning etc were indicated by the application of horse war paint. 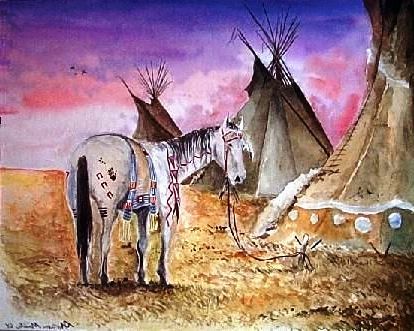 The Native Indians made Horse War Paint from the natural resources that were available to them to make different colored dyes and pigments including red clays, barks and berries, white clays and eggshells, black charcoal, yellow from flowers, plants and moss, blue from clays and duck manure and green from moss and algae. Paint in it's simplest form, consists of ground up pigment suspended in some sort of liquid, or binder such as urine, spit, egg yolks, animal fat and blood. There were so many tribes of Native American Indians it is only possible to generalise the most common meanings of the colors and patterns of Horse War Paint, Body Paint or Face Paint.